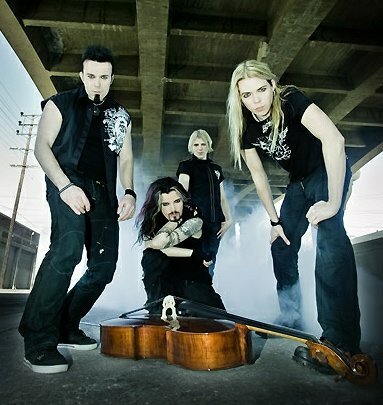 Apocalyptica have announced a co-headlining tour with Dir En Grey that begins in Toronto on August 23 and concludes September 12 in Seattle, Washington. The band’s new album, 7th Symphony will be released August 24th through Jive Recods. The first single off the album is the song “End of Me” which features lead vocals from Bush frontman Gavin Rossdale. The video for the track was premiered on Vevo.com, view it here. Pre-order your copy of 7th Symphony at Amazon now. 9/02 – Minneapolis, MN @ First Ave.
7th Symphony was produced by Joe Barresi (Coheed and Cambria, Queens of the Stone Age, Bad Religion). The album features eight instrumentals plus four tracks with guest vocals including “End Of Me” featuring lead vocals by Bush’s Gavin Rossdale. In addition, producer Howard Benson (Three Days Grace, Creed, My Chemical Romance) returns for production duties on two tracks on the forthcoming album. ← Previous Previous post: The Postelles Announce Dates w/ Interpol & Kings of Leon. “White Night” Video Out Now! Next → Next post: AVENGED SEVENFOLD’S “NIGHTMARE” VIDEO WILL PREMIERE THIS SAT 7/17 AT 11 AM!